The first part has to do with weight transfer. When I watch an amateur golfer, from the top of their backswing, many golfers hang way too far back on your back foot throughout the entire swing. Sometimes, your right foot is still completely on the ground by the time you finish your swing. 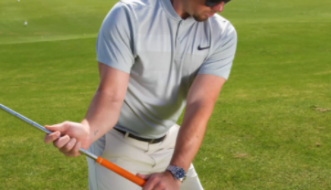 Now, if you watch a player who hits the ball long and straight off the tee, you’ll always see them getting into a finish position that looks different. Watch the video to see. The biggest issue is swing direction. Now, there’s a huge correlation with swinging over the top and where your weight is in your feet. So let’s say 90% of golfers, during the downswing, swing their club over the top or outside, outside and across, or to the left. Something that causes those slice shots. So with this pattern, you’re getting pulls and slices. I’ve got a LOT more to say about this in the video, so be sure to watch the whole thing. The next “golf death move” is angle of attack. So, speaking of distance increase or decrease, angle of attack is a tremendous influencer here. In a one-to-one, the more with my driver that I hit downward on the golf ball, so the club coming from up in the air, the more that it strikes down on the ball with my driver, the shorter I’m going to hit the ball, one-to-one. (This will make much more sense when you watch me demonstrate in the video). So the more I hit down, the shorter it goes, and then the opposite is true. Then, the less I hit down, or even the more that I could actually hit the ball slightly on the way up, the farther it goes. With a normal club head speed, if I got you to swing upward 5 degrees, you could be talking about 25, 30 yards off the tee difference with the same club head speed. Most of you guys watching this video aren’t going to be able to add 10 or 15 miles per hour to your club head speed, which would be required to hit it 30 yards farther, but you can change your angle of attack easier and get those 30 yards with the same club head speed. 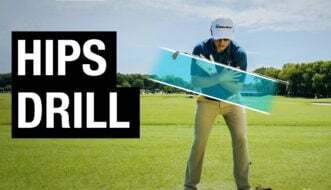 In the video I’ll show you why you swing downward and hit down, and how to get rid of your downward angle of attack so you can hit it much further.